Pre AVG: After graduating from high school in Fort Worth, joined his father in the trucking business. In 1934, moved to California, attended Compton Junior College, and entered Loyola Law School in Los Angeles. 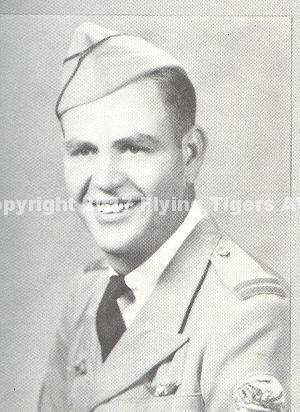 Left school in 1939 to enlist in the U.S. Navy as an aviation cadet, training at Pensacola, Florida. Commissioned as an ensign in 1940, and served as a flight instructor until September, 1941, when he resigned to join the American Volunteer Group in China. AVG Service: Participated in five major campaigns while serving as a Flight Leader in the AVG’s First Squadron. Served until the AVG disbandment in July, 1942. Returned to the U.S. and began flying with the Intercontinental Division of Trans World Airlines. Was the co-pilot of the famous “Mission to Moscow” flight of Ambassador Joseph E. Davies in 1942. Later that year he returned to China as a captain with the China National Aviation Corporation, flying military supplies into China from India over the famous “Hump.” He completed more than 300 flights over the treacherous Himalayan route. He returned to the U.S. in 1944. In 1945, after raising more than $80,000 from among his wartime associates and another $80,000 from businessmen and bought 14 Budd Conestoga cargo planes for $140,000, sold six at a profit and began operation of National Skyways Freight Corp. at the Bendix airport in Teterboro, NJ. In 1947, the line’s name was changed to Flying Tiger Line. He said his main idea was to make money with the airline so he could go back to law school. A four-year fight for official government certification ended in 1949 with approval of the nation’s first commercial all-cargo route. In 1969, FTL was awarded the first scheduled transpacific all-cargo route.